Patented Control Link Rotation System™ inverts container for maximum material discharge. Accepts containers and discharges contents 90° to the left of the load side. 47” discharge height at pour hood discharge, 33” reach. Heavy-duty tubular frame construction with continuous welds. 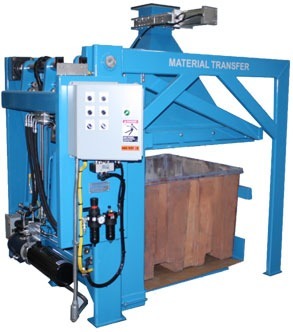 Lift & Seal System™ hydraulically docks container to pour hood for sealed product discharge. Carbon steel product contact surfaces. 8” air actuated slide gate at pour hood discharge. 8” air actuated slide gate with custom transition (not shown) mount to rotary valve inlet. Hoffman NEMA 12 control enclosure with momentary contact controls for safety. 1500 psi hydraulic pumping unit with a 3 GPM gear pump provides smooth operation.